David Schad Ward (born October 25, 1945) is an American film director and screen writer. He is an Academy Award winner for the George Roy Hill heist film The Sting (1973). Ward was born in Providence, Rhode Island, the son of Miriam (née Schad) and Robert McCollum Ward. Ward has degrees from Pomona College (BA), as well as both USC and the UCLA Film School (MFA). 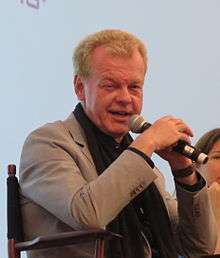 He was employed at an educational film production company when he sold his screenplay for The Sting (1973), which led to an Oscar win for Best Original Screenplay. After this initial success, his follow-up projects were less critically and commercially well received, including Ward's maiden directorial effort, Cannery Row (1982), and a sequel The Sting II (1983). Furthermore, Ward's efforts to sell a script based on the frontier days of California were undone by an industry-wide "ban" on Westerns after the spectacular failure of Michael Cimino's Heaven's Gate (1980). He then wrote the comedy Saving Grace (1985) under a pseudonym. Sting star Robert Redford contracted Ward in 1986 to work on the Redford-directed The Milagro Beanfield War. The response to this project enabled Ward to convince Morgan Creek Productions and Mirage Productions to bankroll Major League (1989), a baseball comedy that he'd been pitching to producers without success since 1982. Major League was a labor of love for Ward, who had lived in the Cleveland suburb of South Euclid as a child and who had rooted for the Indians' teams of the 1950s, including the 1954 American League Champions. "I figured the only way they were ever going to win anything in my lifetime was to do a movie and they'd win," says Ward. Within 10 years, the Indians would appear in the World Series twice. Ward currently is a professor at Chapman University, in southern California, where he teaches screenwriting and directing, and acts as a Filmmaker in Residence for the campus. Another ten years would pass before Ward was credited on another film, Flyboys, a 2006 World War I drama starring James Franco directed by Tony Bill (who was a producer on The Sting). In 2010 it was announced that there would be a Major League 4, starring many of the same cast as the previous films. As of late 2012, the script for the film is reportedly finished, but the film is still in pre-production. 1 2 "David S. Ward Biography (1947?-)". filmreference.com. ↑ DAVID WARD: BACK FROM THE BRINK: DAVID WARD DAVID WARD DAVID WARD Greco, Mike. Los Angeles Times (1923-Current File) [Los Angeles, Calif] 21 Feb 1982: k32. ↑ Giles Hardie. "David S. Ward interview - The Sting". The Sydney Morning Herald. ↑ "Touche For `Mask Of Zorro'". tribunedigital-thecourant.